"Marshall Red Gully, 2003.08.1969" by Timothy K. Perttula and Robert Z. Selden Jr.
DECORATION (INCLUDING MOTIF AND ELEMENTS WHEN APPARENT): The rim has an alternating series of four upper and lower incised triangles. The incised triangles are either filled with tool punctates or diagonal incised lines pitched in opposite directions. The vessel body has vertical brushing marks that extend to within 3.0 cm of the base. 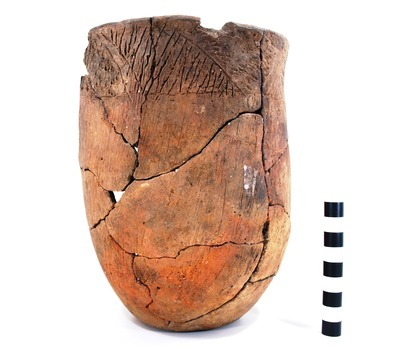 Maydelle Incised jar from the Marshall Red Gully site.